I had some brilliant goals for this weekend. 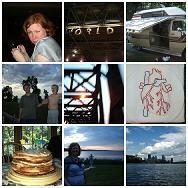 I mean, firstly, let me say that this was my first weekend at home where I didn’t have big sad plans for, oh, say 6 weeks. my apartment was a DISASTER SCENE. papers everywhere! hadn’t swept in months! at least my dishes were clean, but that’s just because washing dishes is about the easiest and most rewarding form of housecleaning you can do. hey presto, all of a sudden things are totally clean. saturday I went to a Society of Women Engineers conference for work and manned the career fair booth. I told so may people how great MyCompany is as a place of employ. it is pretty good, I have to say. and then I went back home and had a fancy spa pedicure and watched tv on the internets until I passed out on the couch. Sunday I woke up full of energy and drive. I spent FOUR HOURS cleaning the kitchen. FOUR HOURS! it wasn’t even THAT dirty! and it’s definately not that big! but I went through my cupboards and tossed open packages of grains and nuts and seeds and beans that were older than 2 years. I wiped off the counters and did the dishes and put things away and rearranged shelves and I even sorted through my plastic bags. that’s right. I sat on the floor and pulled out all of the plastic bags I’d saved from the grocery store and sorted them by size (tiny ones to my car for garbage bags, really big ones got their own container). And I cleaned out a spot under the sink to stick them. So the exciting part about the cleaning of the kitchen is the part where I got on my hands and knees and scrubbed the floor for, like, 2 hours. I hadn’t scrubbed it at all, not even when I moved in, and while I HAD mopped it, there’s something for getting out the wash rags and the sudsy water. And THEN, to really get the job done, after scrubbing with the soapy water I scrubbed with a “magic eraser” (from the japanese dollar store), and then I wiped it down with clean water. I had to change the water, by the way, like, 10BILLION times. maybe not so much of an exaggeration. After I let my dishpan hands recover, I went to the living room and threw all of the papers in the whole house that were not put neatly away where they were supposed to go onto the floor. All of them. And then I sat there for hours and sorted and filed and recycled and tossed and made ready for the shredder. I got nearly every paper in the house sorted and put away! now all that are left on the floor are stacks of books, magazines I haven’t read yet, and a box of odds and ends that I might as well toss, because I don’t miss anything that’s in it and probably won’t in the future. And THAT was my very busy, very productive sunday. what homemaking means for the weekend of May 6 and 7. This entry was posted in all posts, home. Bookmark the permalink. WHOO DE HOO AND GOOD FOR YOU!!!! i scrubbed my kitchen floor like that years and years ago, it was matte black and white checker board, and big, like 12 x 12, and got bursites in both knees! so polish it already, at least it will shine for you! it’s true, meredith! one SHOULD throw the box out. but what if I need that old tube of sunblock in the future??? mom – I knelt on a towel, it was so much better than bursitis!